A Tale of Two GraysonsThe only way to differentiate whose story is in play is to look at the capitalization. If everything is formatted correctly, you have "straight" WG. 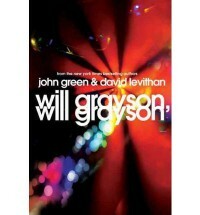 If everything is formatted incorrectly (in lower case letters), you are reading about "gay" WG.Capital letter Will Grayson : I didn't really care much about his story to be honest.Lower-case letter Will Grayson : Wins the battle of the Wills. He's cynical, confused, scared and a complete mess. Which makes his story that much more interesting.Favorite Will-isms :this is about as inspirational as a movie of hitler making out with his girlfriend and having a good time.he's what would happen after nine months if abercrombie fucked fitch.me : dicks before mathgideon : that makes no sense.me : exactly.i have a friend request from some stranger on facebook and i delete it without looking at the profile because that doesn't seem natural. 'cause friendship should not be as easy as that. it's like people believe all you need to do is like the same bands in order to be soulmates, or books. (no, the irony of goodreads friends is not lost on me here. )...and then there's Tiny.Tiny is a character. He's as big as a house, yet seems to have the mojo to pull off landing his fair share of boyfriends. I'm not going to lie...I had absolutely no interest in his "Tiny Dancer" musical and that whole storyline was quite possibly brilliant, yet I failed to care. However, the musical does play a huge part in what might be one of the more unusual endings to a book I've ever read.I'm glad I read WG, WG, but can't honestly say I loved the book. It was worth the time spent on the read though, and I'm off to go discuss it with my buddy read friends.